Springfield, MO. (August 19, 2016) - The popular public art experiment, prominently featured on the Museum’s lawn is set to be disassembled Monday afternoon as part of Drury University’s new student Service Plunge. 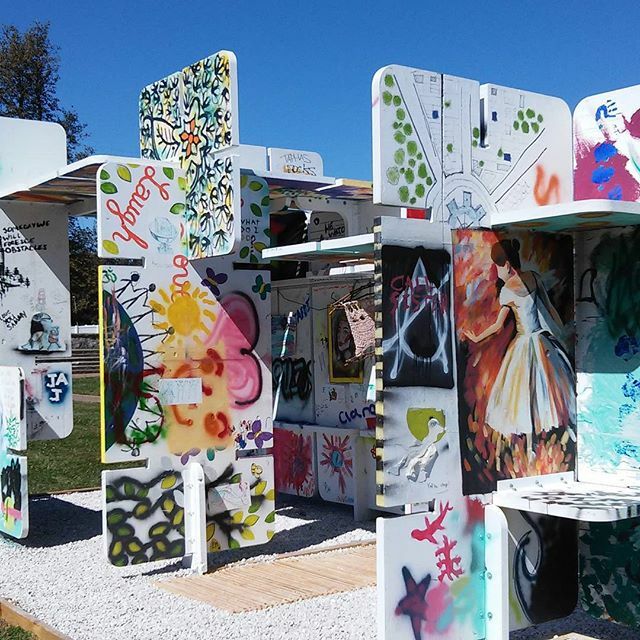 The outdoor exhibition gallery, made up of murals and graffiti panels, has been continuously changing since its installation in summer of 2015. The House of Art(S) is the second temporary public art collaboration between the Springfield Art Museum and Drury University’s Art of Space, with support provided by the Missouri Arts Council, the Hammons School of Architecture, and Conco. The House of Art(S) was designed to be an interactive, participatory art installation. Over the course of the year it has been transformed by the community through the addition (and subtraction) of paint, drawings, poems, quotes, and found objects - including a shopping cart. It has provided a constant platform of community engagement through its 24 hour accessibility and numerous appearances on various social media channels. In addition to the de-installation, Drury students will help begin preparatory work on several outdoor sculptures at the Museum, set to be conserved in early September. The Museum raised $17,100 to make improvements to the Museum’s grounds, the bulk of which came through the #SaveTheFrenchFries Campaign on Give Ozarks Day in early May.